The 14th Asian Schools Chess Championship 2018 was concluded at Citrus Hotel, Waskaduwa, Sri Lanka on July 14. The event was held at beautiful beach resort with the total participation of 450 players from 15 Asian Nations. Participants from Kazakhstan, Kyrgyzstan, Turkmenistan, Uzbekistan, Mongolia, India, China, Iran, Hong Kong, Thailand, Malaysia, Bangladesh, Saudi Arabia, Maldives and Sri Lanka competed in under 7, 9, 11, 13, 15 and 17 Open and Girls Categories. Championship was held as three different events. Blitz, Rapid and Standard. Asian Schools Rapid Chess Championship 2018 was held on July 8. Event was held as Swiss system with 7 rounds and 15 minutes +10 seconds increment time control. Sri Lanka won five medals including two gold medals. Gold medalists were FM Sasith Nipun Piyumantha in under 17 Open category and WCM Ehsha Mishela Pallie in under 11 girls category. The Standard event was held from July 9 to July 14. It was held as 9 rounds Swiss system event with time control of 90 minutes plus 30 seconds increment. Uzbekistan secured 10 Medals including 7 gold medals. Sri Lanka had to satisfy with six medals including one gold medal. 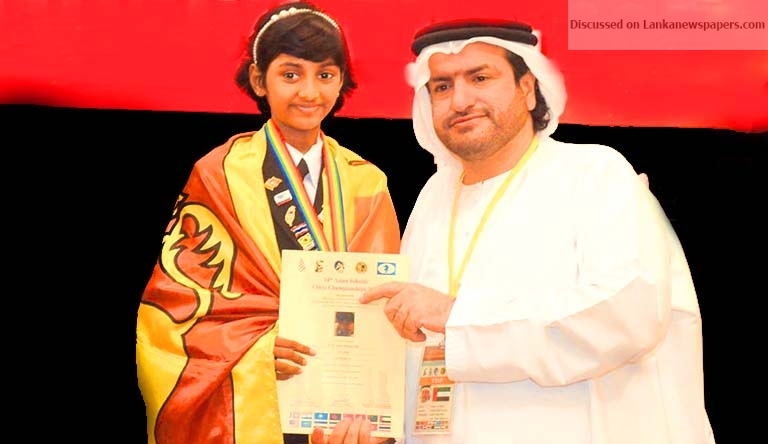 CM Kevin Ranidu Silva won the gold medal in under 13 Open category. Blitz event was started on July 14 evening. It was held as 07 rounds Swiss system event. Time Control was 3 minutes + 2 seconds increment. Sri Lankan medal bucket filled with six medals including a gold medal. CM Kevin Ranidu Silva was the gold medalist in under 13 Open category. Kevin won two gold medals in Standard and Blitz events. 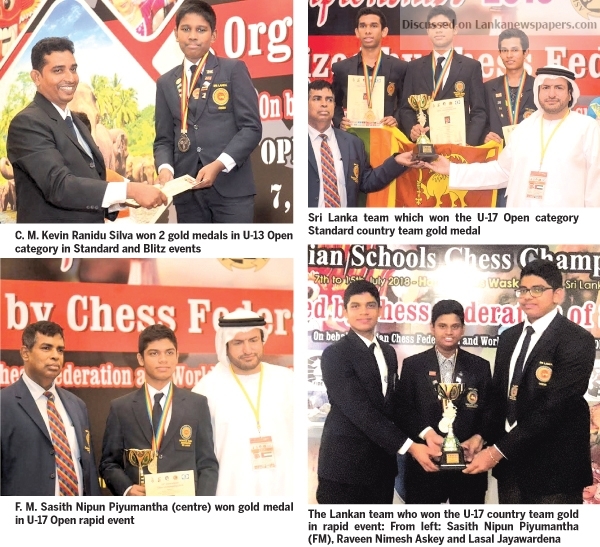 Sri Lanka won the two country team golds in under-17 open blitz and rapid events. The Lankan blitz team included S. R. Deegoda of S. Thomas’ College – Mount Lavinia, Lasal Jayawardena of Lyceum International School and Raveen Askey of St. Peter’s College – Bambalapitiya while the rappid team which won the other gold comprised Sasith Nipun Piyumantha (FM) of Dharmasoka College – Ambalangoda, Raveen Nimesh Askey of St. Peter’s College – Bambalapitiya and Lasal Jayawardena of Lyceum Internatioanl School. Closing Ceremony was held on July 14 night with the presence of the General Secretary of the Asian Chess Federation, Hisham Al Tahir as the Chief Guest. Geoffrey Borg – CEO of the World Chess Federation, Rashid Al Nazar – Legal Councilor of the Asian Chess Federation, Colonel Manjula Kariyawasam – Director General Sport of Ministry of Education, R.M.M Rathnayake – Additional Secretary of Educational Quality Department, Upali Gunasekara – Former president of the Chess Federation of Sri Lanka, Luxman Wijesuriya – General Secretary of the Commonwealth Chess Association, Buddhi Panagoda – Secretary of Chess Federation of Sri Lanka and Indika Jayawardena – Secretary of the Schools Chess Association were present at the awards ceremony.